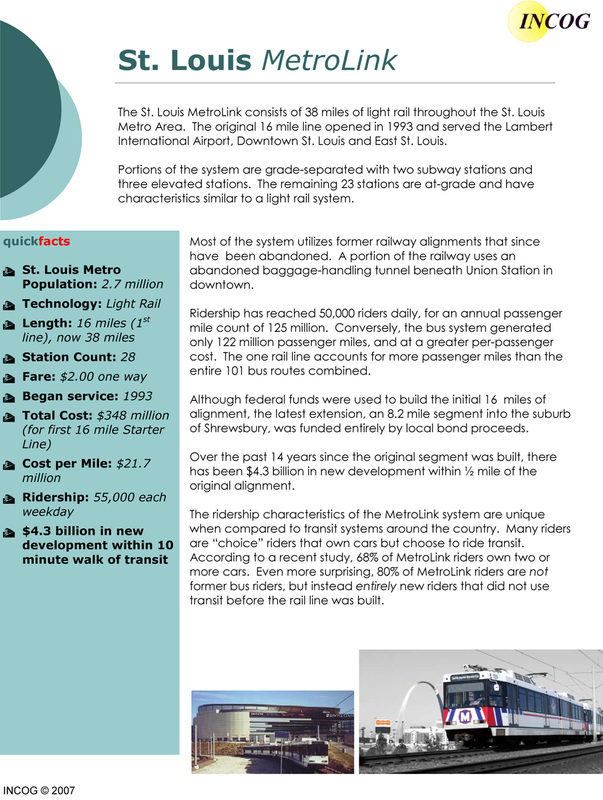 MetroLink is a light rail transit system in the Greater St. Louis area. 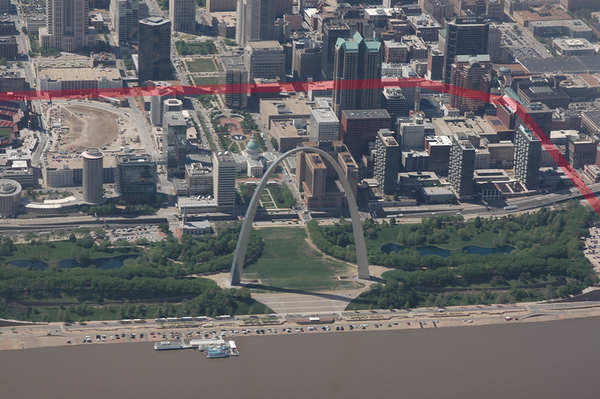 The entire system currently consists of two lines (Red Line and Blue Line) connecting Lambert-St. Louis International Airport and Shrewsbury, MO with Scott Air Force Base near Shiloh, IL through downtown St. Louis. The system features 37 stations and carries an average of 61,573 people each weekday.A second line, the Cross-County Extension, now known as the Blue Line, opened to the public August 26, 2006. 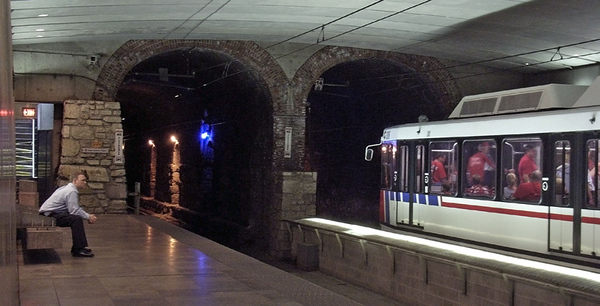 This 8-mile, 9-station line connects Washington University, Clayton, the popular Saint Louis Galleria shopping center and Shrewsbury to the system. 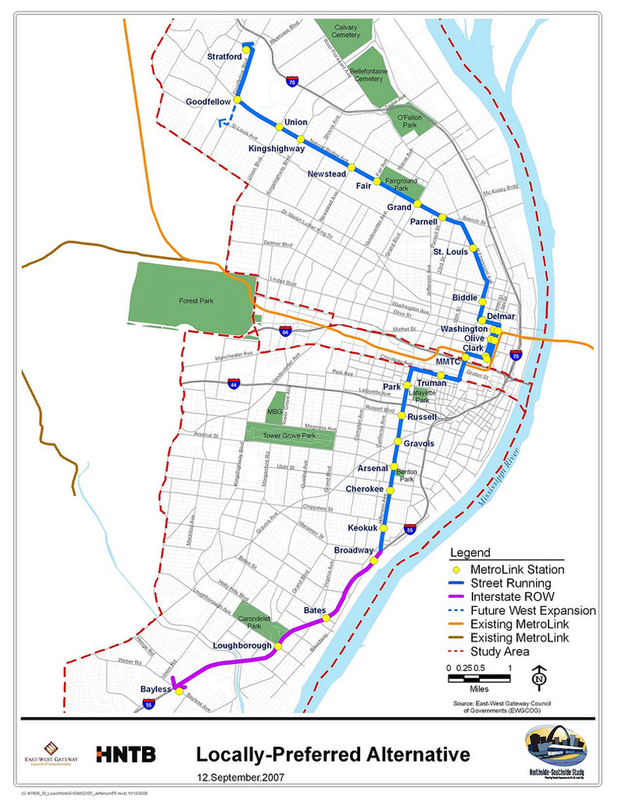 Construction on the initial MetroLink alignment from Lambert-St. Louis International Airport to the 5th & Missouri station in East St. Louis began in 1990. The portion between North Hanley and 5th & Missouri stations opened in July 31, 1993, and the line was extended westward to Lambert Airport Main station in 1994. At that time another station, East Riverfront, was opened in East St. Louis. Four years later, in 1998, the Lambert Airport East station was added. 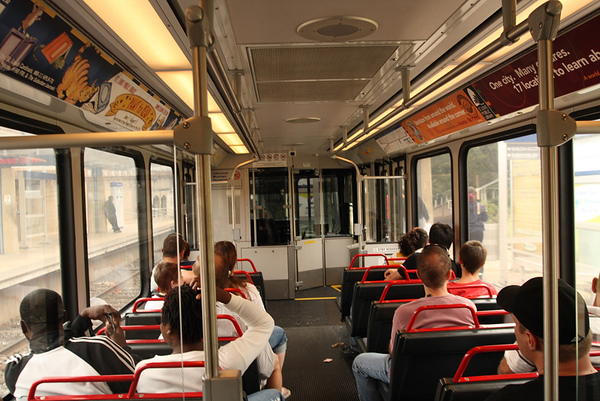 The capital cost to build the initial phase of MetroLink was $465 million. Of that amount, $348 million was supplied by the Federal Transit Administration (FTA). MetroLink exceeded pre-opening ridership estimates, but the system has expanded slowly. Construction on proposed extensions has been delayed by the increasing scarcity of FTA funds. As time has passed, an ever-greater share of the costs has been borne by state and local governments. The most recent work has been entirely funded by local dollars. Construction on the St. Clair County MetroLink extension from the 5th & Missouri station to the College station in Belleville began in 1998 and opened in May 2001. The extension added eight new stations and seven park-ride lots. The total project cost was $339.2 million, with the FTA and St. Clair County Transit District sharing the burden at 72% ($243.9 million) and 28% ($95.2 million), respectively. Local funding was provided by the St. Clair County Transit District as a result of a 1/2 cent sales tax passed in November 1993. In May 2003, a 3.5-mile (5.6 km) extension from Southwestern Illinois College to Shiloh-Scott station opened. This $75 million project was funded by a $60 million grant from the Illinois FIRST (Fund for Infrastructure, Roads, Schools, and Transit) Program and $15 million from the St. Clair County Transit District. The recent Cross-County Extension project was funded by a $430 million Metro bond issue. Metro cited repeated delays and cost overruns as its reasons for firing its general contractor in Summer 2004. The contractor, itself a coalition of four general contractors (Cross County Collaborative), in turn cited excessive change orders by Metro as the cause of the problems. After firing the general contractor, Metro functioned as its own general contractor on the project. Metro sued the Collaborative for $81 million for fraud & mismanagement. The Collaborative counter-sued for $17 million for work that Metrolink hadn't yet paid for. On December 1st, 2007, the jury voted in favor of the Cross County Collaborative, awarding them $2.56 million for work as yet unpaid for. The rail portion of the extension opened to the public August 26, 2006, and a parking garage at the Brentwood I-64 station opened on June 12, 2007. The garage parks 1000 cars where riders can park for free. In October 2008, Bi-State added color to their respective lines. 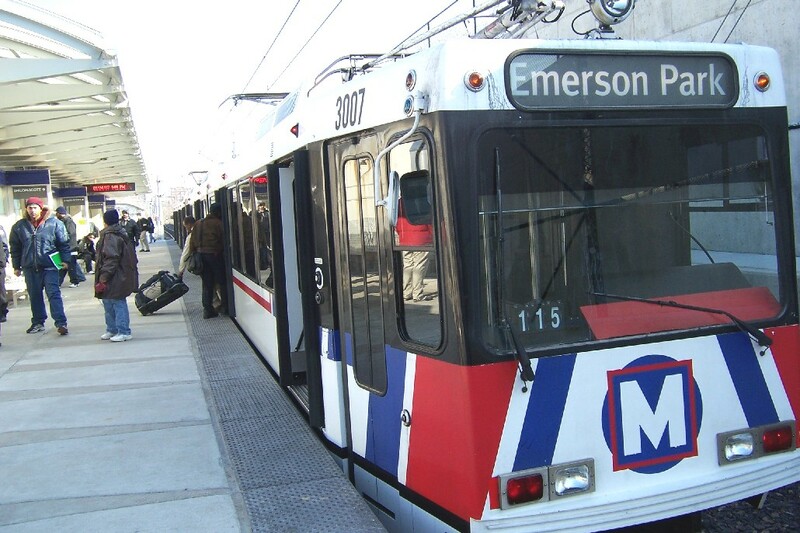 On October 27, 2008, Metro renamed the two MetroLink lines using color designations: the Lambert Airport branch was renamed to the Red Line; the Shrewsbury branch, the Blue Line. Service was also extended on the Blue Line from its former terminus at Emerson Park to Fairview Heights. All trains have a red or blue sign on the front that identify the train as a Red Line or Blue Line train, and all operators make station announcements identifying the Red Line or Blue Line. Studies are underway for a new north south line that will run from Bayless to Stratford. Civic Center Station MetroLink operates a fleet of 87 light-rail vehicles composed of 31 SD-400 and 56 SD-460 vehicles. Each 90-foot, single articulated vehicle has 4 high platform doors per side and has a capacity of 72 seated and 106 standing passengers. The cars are powered by an electric motor which gets its electricity from a catenary wire with a 750 volt current. Each car has an enclosed operator cab at each end. This allows the most flexible system for managing operations, but prevents travel between cars except at stations. Each car also has separate doors for station level and track level access. In normal operations the track level doors (equipped with stairs) are unused. There are two train yards in the transit system for the storage and maintenance of light-rail vehicles: the primary yard is located between the Grand and Union Station stops just west of downtown St. Louis; the other yard is located between the JJK and Washington Park stops in Illinois. Reduced fares can be purchased by seniors ages 65+, people with disabilities, and children ages 5-12. Children younger than 5 years of age ride free. Proof of age may be requested of all people riding with reduced fares. Weekly and monthly passes are also available in addition to the fares listed above. 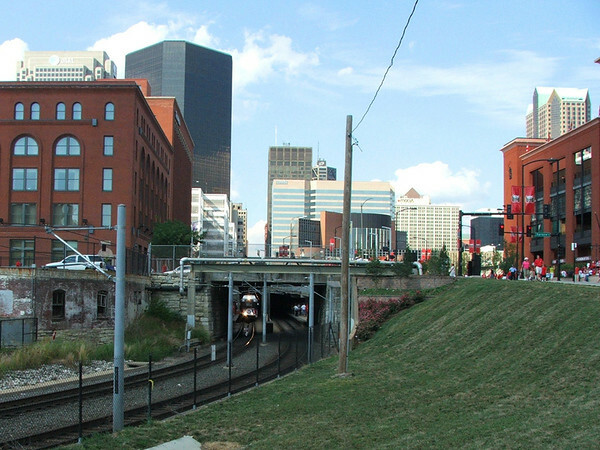 The Metrolink light rail system uses an old tunnel system that runs under downtown St. Louis and out across the Eads Bridge to Illinois and the east side of the Mississippi River. A west bound train is entering the station to pickup fans from a Sunday game. Historic Metrolink tunnel entrances. We build things with much less texture nowadays. An 1874 tunnel beneath Washington Ave. and 8th St., along with other bits of abandoned railroad ROW (notably the Eads Bridge), were creatively deemed St. Louis' 25% "local match" for the federal funds that built Metrolink's first phase, resulting in a cost of just $20M/mile. 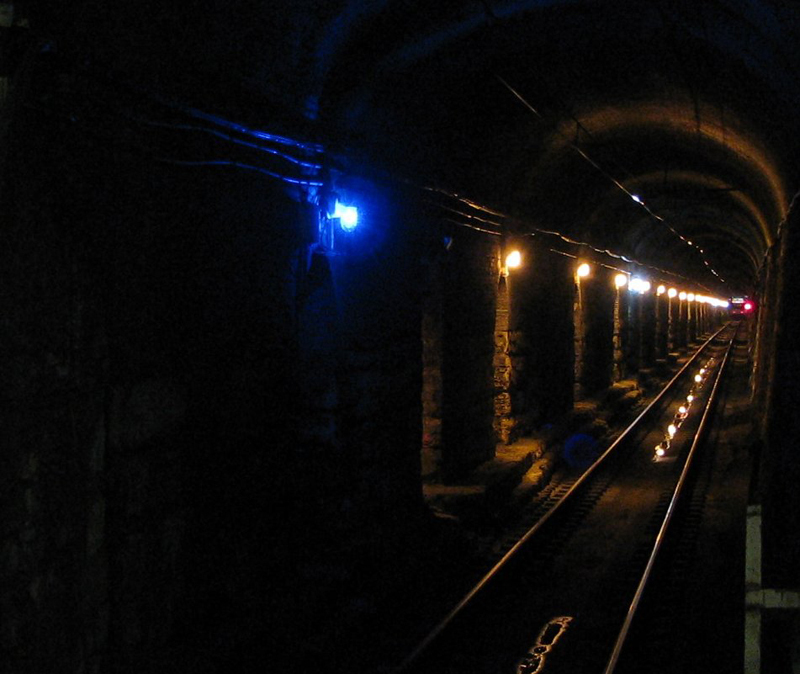 Some bittersweet history: the tunnel was initially built to bypass St. Louis' already built-up downtown, connecting the terminal and railroads west of downtown to the Eads Bridge over the Mississippi and to the East. Unlike Chicago, which embraced the railroads a little too zealously (nearly giving away ROWs along the riverbanks and the south lakefront -- well, in exchange for political favors), St. Louis's trade centered around the docks, and its port interests jealously guarded their cargo from the new railroad competition. According to William Cronon, this initial skepticism about the railroads ultimately sealed St. Louis' fate relative to Chicago -- Chicago's railroads had crossed the Mississippi (at Rock Island) 18 years before the Eads Bridge opened. In 1870, both cities had roughly 300,000 residents; twenty years thence, St. Louis had grown 50% while Chicago had leapfrogged to twice that size -- over one million residents. What does this mean for Jacksonville? 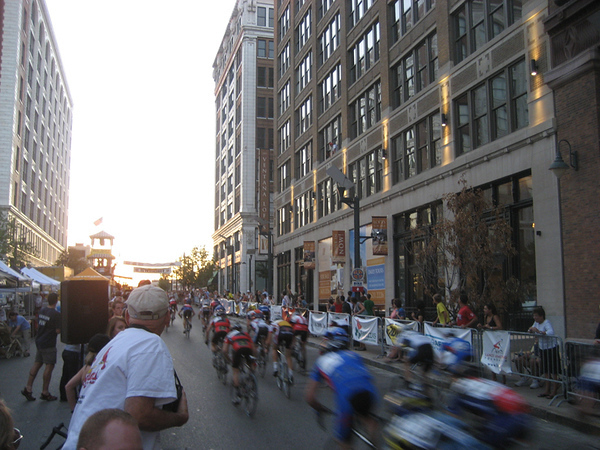 It is hard to deny that Metrolink has become a game changer for St. Louis. The Success of Metrolink can benefit Jacksonville. Like Jacksonville's urban core (the original city), St. Louis had been in decline for several decades. 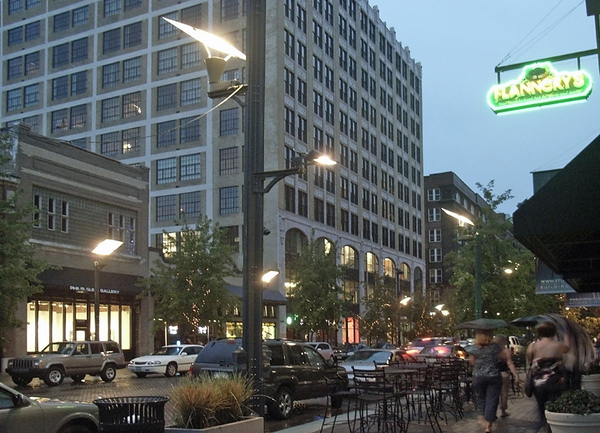 Today, urban St. Louis has stabilized and is growing once again, fueled by $4.3 billion in new development within a 10 minute walk of Metrolink. In addition, Metrolink continues to exceed original ridership estimates with more than 80% of passengers who did not use local bus transit before the rail line was built. A major reason being that the system provides an efficient alternative option to access a variety of popular destinations in the St. Louis region. As Jacksonville moves forward, all transit corridors should be designed and implemented to start and terminate at popular pedestrian oriented destinations within our community. 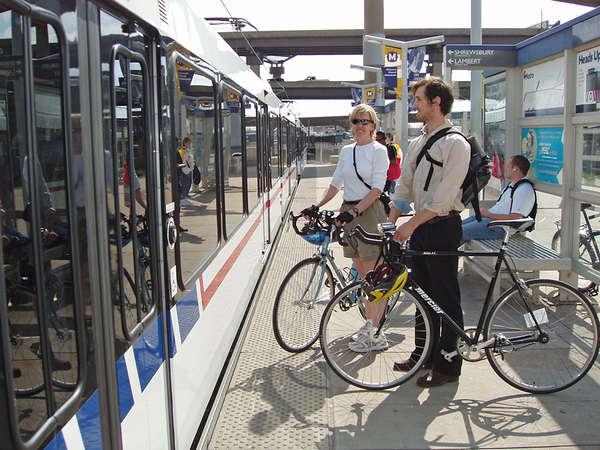 Last, but not least, Metrolink is proof that a community will rally around a viable transit alternative. With $100 million for rapid mass transit already in hand, Jacksonville's leaders need to immediately make a move to turn decades of study into reality. 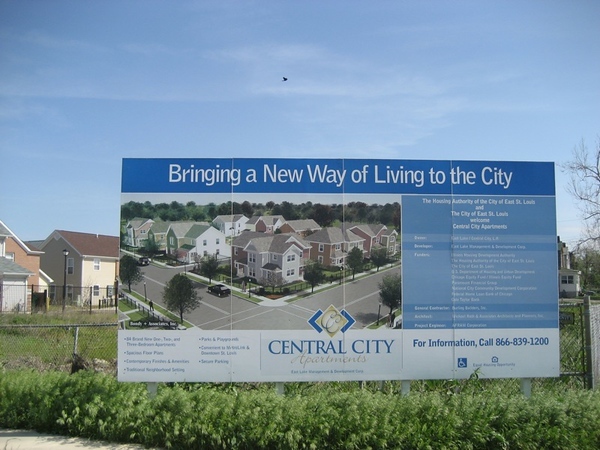 We can not afford to let this financial resource go to waste on inferior proposals that do not have the power to enhance quality of life in Jacksonville.